The Instant Pot is one of the hottest cooking tools around these days. With its ability to pressure-cook foods in mere minutes, all in one pot, it is a huge time-saver for busy home cooks. You can even bake a cheesecake in it! A ketogenic diet that eliminates processed foods sometimes require a little more effort in the kitchen, so any time saved is a plus. 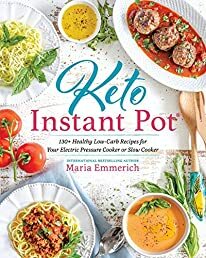 In this book, international bestselling author Maria Emmerich presents more than 160 delicious low-carb, high-fat keto recipes designed to be cooked in an Instant Pot or other multi-cooker. The recipes run the gamut from appetizers and sides to soups to main dishes to sweet treats and even a few drinks, along with some handy keto basics. As a bonus, Maria also includes slow-cooking instructions (which can be done either in the Instant Pot or in a separate slow cooker) for each recipe for those days when set-it-and-forget-it convenience takes precedence over the need for speed. You’ll also find tips for success, along with Maria’s recommendations for Instant Pot extras to consider purchasing to make keto cooking easier. So what are you waiting for? Add this handy kitchen appliance to your low-carb cooking arsenal and put it to good use for tasty and healthy keto meals! Quick & Easy Ketogenic Cooking: Meal Plans and Time Saving Paleo Recipes to Inspire Health and Shed We..